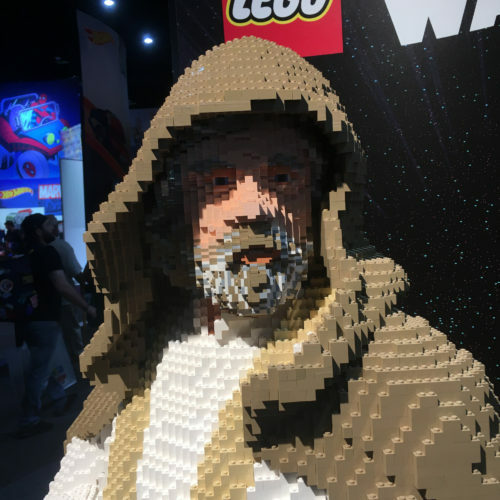 Every year, one of the top three Comic-Con booths for kids is LEGO, with tables set up for kids to use the bricks and build, while also advertising new building sets and video games. And of course, they lure us in with intricate life-sized statues made of LEGOs, based on pop culture of the moment. This year takes one from column A, one from column B, and one from column DC. 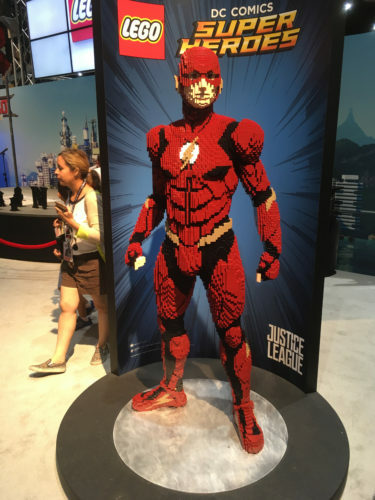 First, what clearly is Ezra Miller’s version of The Flash from November’s Justice League. Yes, I mocked it slightly earlier today, but it’s still an impressive achievement, even if he has a problem with, ahem, his shading. 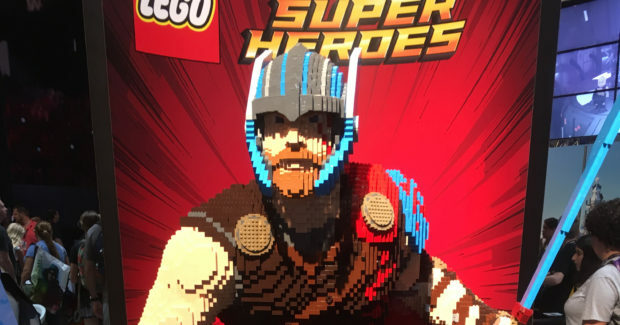 Over on the Marvel side, LEGO built a Thor figure, sporting the look from the upcoming Thor: Ragnarok. 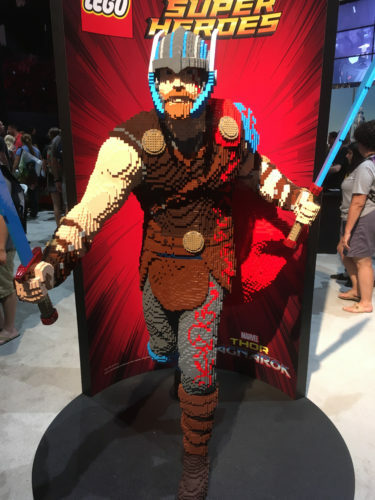 While not quite as tall as Chris Hemsworth, it still looms large. But here’s the masterpiece, a portrait of Mark Hamill as Luke Skywalker in the opening minutes of The Last Jedi (or, if you prefer, the closing minute of The Force Awakens). It’s not just his stance; somehow, they’ve recreated the sad, quizzical yet knowing look that he has. 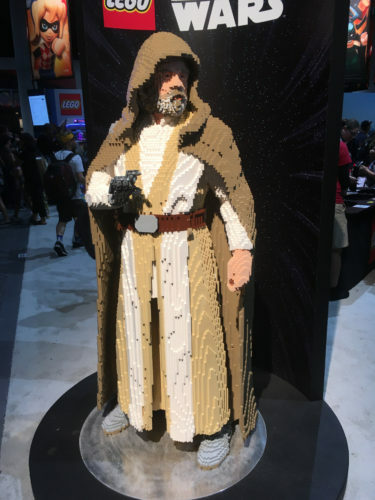 And this last one wasn’t actually at the LEGO booth. 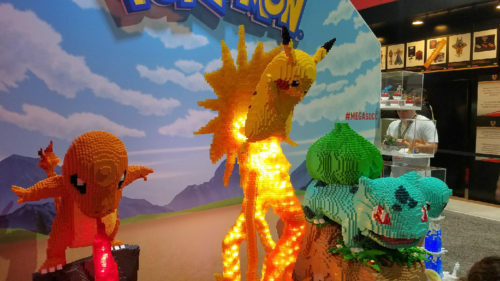 Jason Salazar sent it over to me, saying “it was in a booth full of Pokemon stuff.” Fanboy Planet does not vouch for the authenticity of the LEGO bricks here, but if it can be built, it can be built out of LEGOs. Actually, that explosion behind Pikachu is a representation of what it feels like to step on a LEGO brick, though thankfully, at Comic-Con there don’t seem to be any on the actual floor.